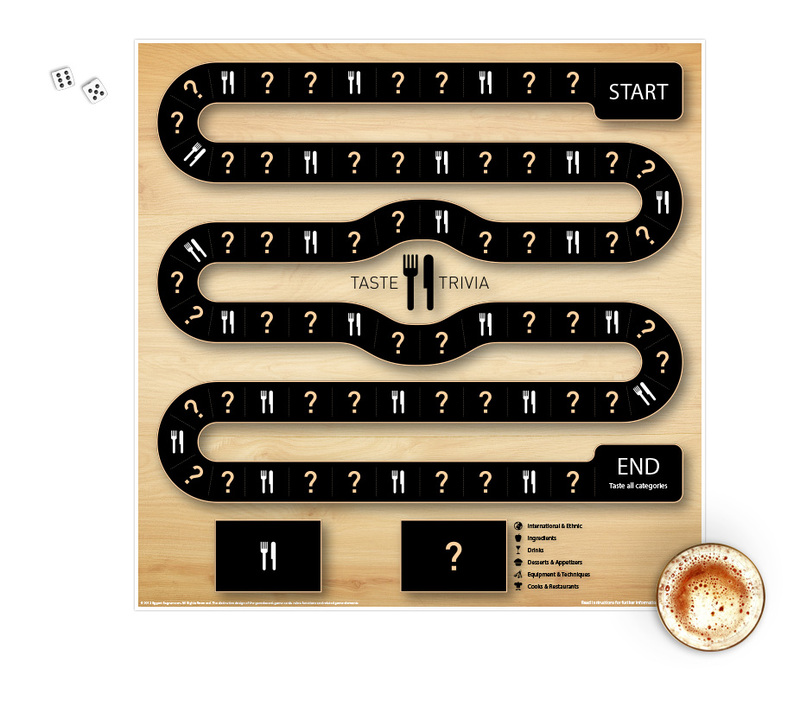 Taste Trivia is a board-game about tasting different food and/or drink items and answering culinary trivia. Please take a look at our Kickstarter video and please scroll down for more information about our game. So the questions can range from anything such as cocktail ingredients, national dishes of countries, whisky origins, cooking terms, known chefs, beer types etc. Players can play individually, or as a group for a large get together. There are various Taste Test challenges, such as tasting two samples together and picking another player to sample the same i.e. whisky, prosciutto or beer with you, and help you come up with the correct answer. The first person to reach the final square will have to guess correctly on one sample from each category to win the game. So in short this is a game about getting together with friends, tasting good food, having drinks and doing culinary trivia. Which we hope you enjoy as much as us. Players do blindfolded Taste Tests between different Italian wines, salami, cheese, olives, beers or absolutely anything you want. Its a game that challenges your tasting palette and your culinary knowledge. If you are throwing a dinner party, having friends over for beers, or are a enthusiastic cook and love food, Taste Trivia is created for you. As you play the game, you will need to do random blindfolded taste tests to advance, as well as picking other players to taste the same food or drink item with you. Taste Trivia can be scaled to any size. The Taste Tests samples can be split up to four different categories or only two, for example tasting and guessing on different white wine and cheeses.